Tool Equipment Manufacturing :: VIDIRA-BULGARIA Ltd.
"Vidira" company has over 15 years of experience in the fields of designing, developing and manufacturing of custom made tools, molds and dies. As a company, we provide unique solutions for your product. Here at "Vidira ", we respond quickly to your production needs with tool equipment manufacturing. 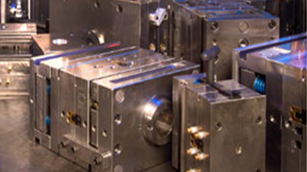 When producing molds and dies, we are precise and efficient. Here at "Vidira ", we develop our projects in various CAD formats. We can also work the "old way " with your samples, drawings , patterns, parts or any existing forms. The production cycle is fully closed - from the tool design and construction processes to the final product . Each stage of production processes is strictly controlled and no compromise on quality is allowed. One more thing that we are committed to is providing high quality customer service. Our team of engineers has decades of experience in designing. The manufacturing of a wide range of metal and plastic parts, produced by relevant tool equipment, is provided by high technical base of Instrumental Mechanical Workshop. In this dynamic market, our team of experts is on a constant watch for innovation and strives to implement them timely in production. We also perform plastic injection molding parts with customer's tools.